Audio books are becoming more popular. Once the province of people who couldn’t read with any great ease, they were often the next step up from large print books for readers with failing eyesight . Well that’s all changed and now growing numbers of people listen to audio books as a matter of convenience. They’re great for long journeys by car, train or plane, they are very easy to transfer to i-Pods and other MP3 players and I even listen to audio books in the gym (yes, you wouldn’t tell it to look at me but I do go to the gym). 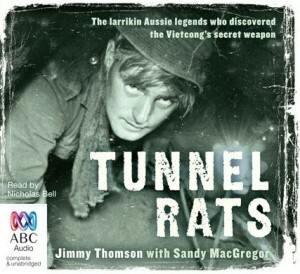 So there’s one version of Tunnel Rats that we’ve neglected and that’s the audio book. It’s read by Shakespearean actor Nicholas Bell and he really brings the story to life. You can buy it online HERE and it’s just the thing for that next long road trip – I think of it as The Wiggles for grow-ups.